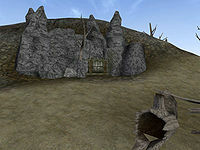 Minabi is a medium-sized bandit cave directly south of the stronghold Telasero in the Azura's Coast Region. The slave cave entrance is by the coast, southeast of Suran. When heading south from Telasero there is a range of steep hills on the right (west) and water on the left (east). Where the road meets the coastal waters make a u-turn up around the hills to the right. The first room consists of two levels, separated by trapped doors. 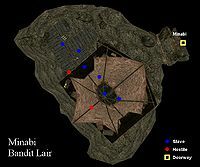 Bedenea Nethan has a probe on her to deal with the traps and a Simple Key, which opens the third, locked Worn Cavern Door, leading to the Minabi Bandit Lair. A Scroll of Invisibility and a Scroll of Manarape are next to her on the table. A Scroll of Windform (500 pt. levitation and invisibility for 60 sec.) and a Scroll of Shockbane lie on crates with random loot. The Minabi Bandit Lair has multiple levels. Upstairs under the tent cover is the Redguard, Chrelm, who holds the Minabi Slave Key. On a drawer with clothing are two Scrolls of Insight. Under the canopy are several hammocks and the remains of a drunken party, with many mazte. There are shalks, fighters, and magic users here, along with six slaves under the platform. Bedenea Nethan will provide medium training service in Short Blade, Light Armor, and Sneak if she is successfully calmed or snuck up on. The leveled loot may include scrolls, potions, gold, gems, equipment, ingredients, soul gems, magic items, and two skill books; The Gold Ribbon of Merit and Surfeit of Thieves. This page was last modified on 8 September 2018, at 03:59.